Now you can take the Museum with you! Norman Rockwell Museum has announced the release of its new mobile Museum app available as a free download from the iTunes App Store and the Google Play App Store. 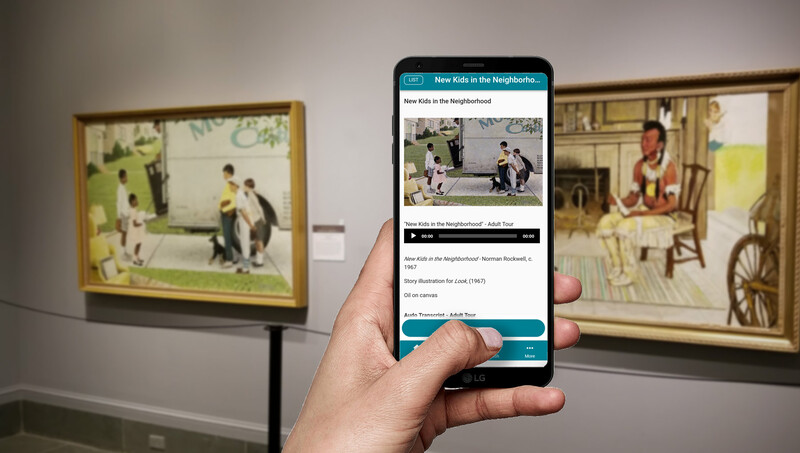 This mobile app gives Norman Rockwell enthusiasts access to the Museum’s award-winning audio tour that can be used when visiting the Museum in Stockbridge, Massachusetts, or at any one of the Museum’s traveling exhibitions on view at other locations across the United States and abroad. It also provides access to past exhibitions that are no longer on view at the Museum that patrons may to want view on demand at their leisure. This app provides users with a unique look at the work of Norman Rockwell as well as other noted illustrators through content specifically produced for the Museum’s audio tours as well as content pulled directly from the Museum’s collection and archives. Most notably is the inclusion of oral histories by many of Rockwell’s models and friends, interviews with the artist, and other items including reference photos that depict a view into Rockwell’s artistic process. To make the experience as easy as possible, the Museum collaborated with Cuseum to develop a relatively new feature in Museum apps that allows users to use the camera function on one’s mobile device to scan an image to access the audio tour content on the app. “Now, instead of having to plug in a number to access a stop on the audio tour, users can simply point their device’s camera at an image and the app will recognize the image and pull up the audio content automatically,” says Rich Bradway, the Museum’s director of digital learning and engagement. “What makes this function really neat is that it works not only with the paintings on the wall but also with an applicable Rockwell image that you might have in your home,” Bradway adds. The mobile app also provides information about how to visit the Museum in Stockbridge, Massachusetts, incuding Museum hours of operation, admission prices, and information about Museum amenities such as gallery talks, the Museum shop, and the terrace café. For traveling exhibitions on tour at other venues in the United States and abroad, the mobile app provides information about when and where those exhibitions are on view. Coming in July 2018, the Museum will add Spanish language support for select Rockwell images on view in the Museum, as well as language support in six additional languages (Spanish, French, German, Chinese, Japanese, and Arabic) for the Museum’s traveling exhibition Enduring Ideals: Rockwell, Roosevelt and the Four Freedoms. Download the Norman Rockwell Museum App today!